With traditional attics this is the best option to effectively insulate the space. This will, in turn protect your building from heat loss, water damage, mildew, mold growth, and other possible damages to its structural components. 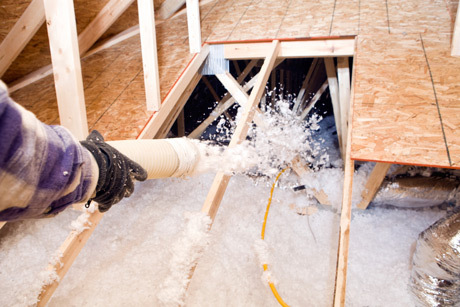 Blown in insulation is applied with a machine that shreds the fiberglass or cellulose insulation. Then it is blown through a hose filling the gaps and giving you a complete layer of insulation. Air flow is equally important when talking about attic insulation within the building system. venting baffles are typically used to allow your attic the air to breathe, eliminating ice dams. We will take the time to carefully ensure you attic gets the proper air flow and the correct amount of insulation to reduce your energy cost. Improving the insulation in your attic will increase the R-value, which measures how well insulation resists heat. We exceed recommended R-values and install at least an R-49 in our customers’ attics. This will make your home more efficient, keeping you cooler in the summer and warmer during winter months, while saving you money on energy costs. Energy Star estimates that the average homeowner can save up to 20% annually in heating and cooling costs by addressing air leaks in their home. Whether you’d prefer fiberglass or spray foam, our insulation systems will significantly increase your R-Value, saving you more over time, hence recouping the cost quicker. Cellulose is made with over 80% post-consumer recycled content, making it one of the “greenest” insulation options available. It also has the lowest embodied energy (the total energy required to produce a material) and the smallest carbon footprint of any other insulation product. After testing thousands of homes, our results back up what the national certifying laboratories claim: attics insulated with cellulose maintain high R-Values under all conditions, are better air sealed, and harbor fewer pests. The attic is the most important part of your home to insulate. This is because it is the highest space in your home, closest to the outdoors, with only the roof between the attic space and the elements. Since hot air rises, you don’t want to lose that precious air in the winter. Insulating it properly will help ensure attics and ceilings with cold spaces above, including dormer ceilings, will contain energy and save you money. With 45 million homes in the U.S. being under-insulated, it’s an easy decision to protect your home with the best brands and installation for insulation in MN. By adding the right amount of insulation in your attic, you will be better able to maintain the desired temperature throughout the home. In addition, when you have proper attic air sealing, this works double time to prevent the formation of dangerous ice dams in the winter. In order to keep up with the latest energy conservation and efficiency standards, you likely need additional quality insulation, especially if you live in an older house. We only use products by the best manufacturers, such as Owens Corning insulation, to ensure quality and value. Try the interactive Alside Design Showcase to see all the different window options for your home! Custom Trim Packs: We can provide custom window,door and base trim packs for every residential project complete with stain and installation. As a family owned business, Lifetime Builders understands all aspects of construction and ensures that all roofing, siding, windows and the other exterior improvements are correctly and accurately installed. © 2018 LifeTime Builders Lic #BC716495. All Rights Reserved.